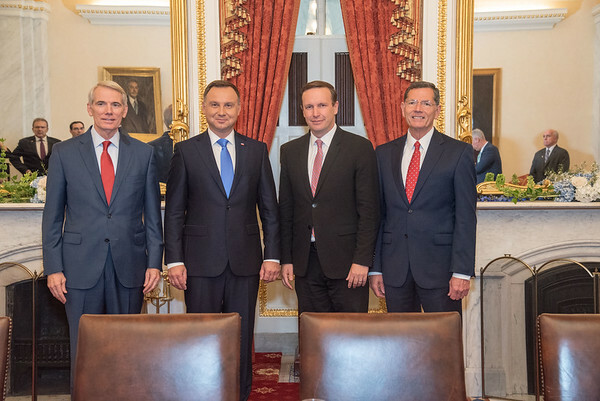 NEW BRITAIN - U.S. Sen. Chris Murphy discussed the close ties between Connecticut and Poland last Tuesday during a meeting with Polish President Andrzrej Duda in Washington D.C.
“The United States, and Connecticut and the New Britain area in particular, have close ties to Poland and the Polish people. I appreciated the opportunity to meet with President Duda and other Polish dignitaries yesterday.” Murphy said Wednesday. “During our conversation, he shared my belief that Europe must stay united amid new threats from Russia, and I was glad to hear the president outline new measures that will loosen the Kremlin’s grip on energy markets. Duda visited Washington with the purpose of meeting with President Donald Trump. Both leaders held a press conference to discuss topics such as security, military relations, the Three Seas Summit and the bilateral economic relationship between the two nations. Murphy’s meeting with Duda and others in the Polish delegation took place after the conference between the two presidents concluded. Murphy has a long history of supporting the government of Poland’s relationship with Connecticut and Sikorsky Aircraft in particular. In October 2016, the senator released a statement in which he praised Poland for purchasing 70 Sikorsky Blackhawk helicopters. Murphy was not the only local who met with Duda. Adrian Baron, the Little Poland lawyer and president of the Polonia Business Association, was also in Washington as Murphy’s guest for a reception at the residence of Piotr Wilczek, the Polish ambassador to the U.S. During the gathering, Baron was able to tell Duda and first lady Agata Kornhauser-Duda about New Britain’s Polish community and neighborhood. 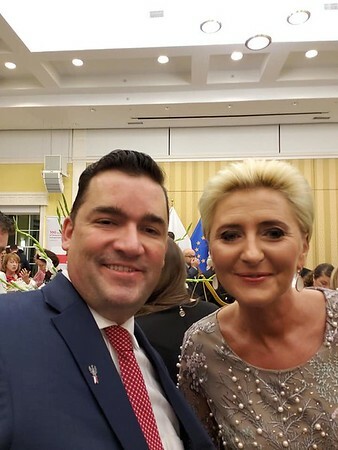 In addition, Baron made sure to tell the Polish first lady about the amount of Polish individuals investing in the city of New Britain with manufacturing and jobs. He also thanked Murphy for his involvement in the community. Posted in The Bristol Press, General Business, Manufacturing on Monday, 24 September 2018 20:43. Updated: Monday, 24 September 2018 20:46.